A new book to help us practice loving kindness every day! We each have the capacity to realize a vast open heart and to genuinely help others. 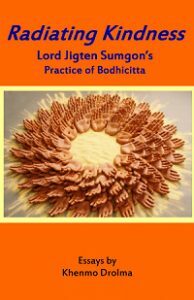 Monks and nuns, for centuries, have used this particular practice, which was passed down from the founder of the Drikung lineage – Lord Jigten Sumgon. In our lineage, Bodhicitta ( loving kindness and compassion) is the fruition of all practices. Included also are Khenmo Drolma’s words of wisdom, based on her experience practicing this profound loving kindness meditation. How to train your mind to see all whom you meet as beloved. Please donate. All proceeds from sales go to support the nuns of Vajra Dakini and Samtenling in Dhera Dun, India.